Serving the marginalized and under resourced populations of the Twin Cities, Good in the ‘Hood is called to influence, inspire and impact individuals, families and entire communities for good. Each month, in collaboration with dedicated partners, Good in the ‘Hood provides groceries, meals, food for hungry college students and practical resources for over 3,000 individuals. Their youth mentoring, internships and adult advocacy programs offer effective support for those desiring to move forward in life. Their special events, Mobile Dental Clinic, Community BBQs and Holiday Help programs provide a visible means of community care and compassionate support for the economically challenged. 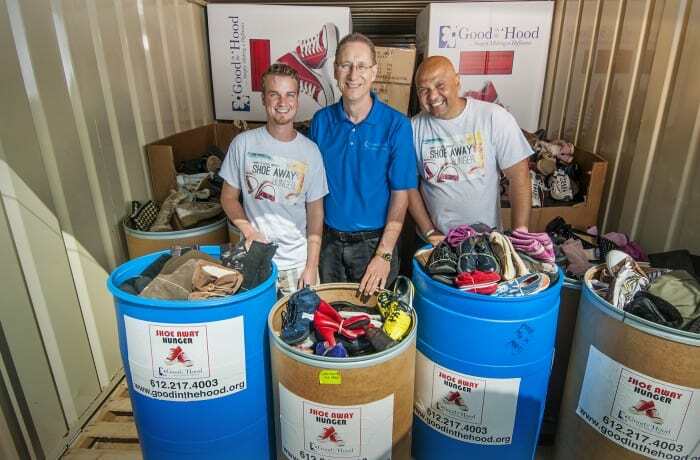 Their Shoe Away Hunger program takes donations of new and gently-used footwear, then either gives or sells them to individuals in need of footwear. Volunteers collect, sort and distribute the shoes in communities. Any proceeds are used to benefit our Feeding the Futures program. A warehouse and storage solution for our shoes and bus. Who do you know that could provide or help us find a free or reduced-price warehouse in Bloomington, MN? A better way to manage inventory. Who do you know with inventory management and logistics expertise? What suggestions can you offer for a better system? Raise awareness of Shoe Away Hunger. What suggestions do you have for promoting Shoe Away Hunger and the Shoe Bus? Where should we consider hosting shoe sales/distributions?